(Bloomberg Opinion) -- By conventional measures of stock prices, Amazon.com Inc. looks very expensive. It’s actually surprisingly cheap. Twenty-one years after it went public, a share of Amazon stock costs 70 times more than the company’s estimated per-share future earnings. That means investors are willing to pay much more for each dollar of Amazon’s earnings than for shares of Microsoft, Apple, Facebook, Alphabet or Alibaba. The everything store’s price-to-earnings ratio is four times higher than that of the S&P 500 index. Yet even at this valuation, all but one of 52 analysts surveyed by Bloomberg recommend owning the stock, and 48 of them say that investors should buy it and keep it, according to data compiled by Bloomberg. Which makes Amazon something few analysts ever believed it could become: a value stock, fetching a modest price considering the company’s opportunities for growth. To understand why Amazon remains a bargain means acknowledging the commitment to create efficiency for consumers by spending more money on more works in progress than anyone. Amazon’s market capitalization just became greater than the combined worth of the leading companies in six different industries where it is a competitor. The prospectus from the initial sale of Amazon stock on May 14, 1997 said the online bookseller might never make money, and that its operating costs were greater than rivals Barnes & Noble Inc. and Borders Group Inc. Within a month, Amazon was down 19 percent. The company's gross margin (revenue after the cost of goods sold) of 22 cents on the dollar was dwarfed by Barnes & Noble’s 36 cents and less than Borders’ 27 cents. While first-quarter sales surged to $16 million from $875,000 a year earlier, losses widened to $3 million from $331,000. “I just don’t see how they’re going to have the muscle to pull this off,” McCabe Capital Partners’ Steve Zenker told Bloomberg News in May 1997. He was expressing the widespread opinion that Amazon was incapable of trading at a discount relative to dividends, earnings and sales, and that the fundamentals of value investing such as a high dividend yield and low price-to-earnings ratio were impossible for the Seattle internet startup. The strategy of relentlessly innovating by reducing customer costs and increasing convenience at the expense of quarterly earnings helps explain why Amazon shares beat the world and gained 498 percent during the past five years as the top performer among the 15 companies in the Bloomberg Intelligence Global E-Commerce Index. The also-ran S&P Consumer Discretionary index and S&P 500 advanced 107 percent and 87 percent. It took less than a year for Amazon’s market capitalization of less than $500 million to exceed the $2.6 billion of No. 1 Barnes & Noble. By 2015, Amazon was worth more than $220 billion, exceeding the value of Walmart Inc., even though the world’s largest retailer had $505 billion in total revenues, more than double Amazon’s $193 billion at that point. In the business of leasing information-technology gear, by contrast, Amazon didn’t need to play catch-up. “Amazon had over a five-year head start over its rivals in cloud computing, where enterprises rent infrastructure instead of buying it,” said Anurag Rana, a senior analyst at Bloomberg Intelligence. Despite strong growth over the past decade, the cloud computing business represents less than 10 percent of total information-technology spending, which shows that the cloud has a lot more room to grow in the coming years. 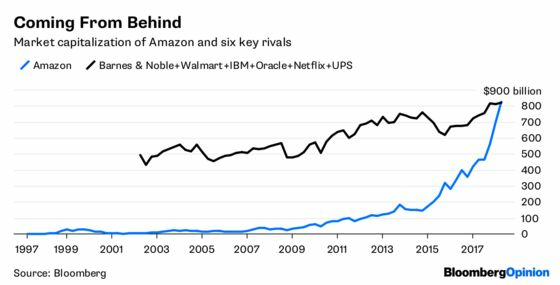 This shift in spending is likely to disadvantage legacy tech companies like International Business Machines Corp. and Oracle Corp.
Amazon also is competing in video streaming with Netflix Inc., whose market capitalization still is about a fifth of Amazon’s after growing 10 times during the past five years. President Donald Trump’s attacks on Amazon may hasten the company’s plans to become an entrenched logistics leader, having already overtaken United Parcel Service in 2009. Few were surprised when Amazon said on June 28 that it was buying PillPack, a nationwide drug network competing with traditional pharmacy chains like including Walgreens Boots Alliance Inc. and CVS Health Corp.
Amazon is now worth about as much as the combined $831 billion market capitalization of six competitors, Barnes & Noble, Walmart, IBM, Oracle, Netflix and UPS. And money managers are showing that they expect this kind of relative strength to persist: 730 non-index mutual funds in the U.S. invested $103 billion in Amazon, easily surpassing the $73 billion invested by 1,171 non-index funds in the six rivals combined, according to data compiled by Bloomberg. And Amazon invests huge sums on technology and content spending for future product development, $25 billion during the past 12 months. That dwarfs the $18 billion spent by another big investor in research and development, Samsung Electronics Co. The R&D expenses of more than 1,000 global retailers, excluding Amazon, was $9 billion for the same period. That’s pretty much the definition of a value stock.